Overall, the similarities between consumer survey in the two types of cases outweigh the differences. So some of these differences are necessarily exaggerated. Structural Differences. Lanham Act false advertising cases always involve competitors. Trademark litigation can involve a broader range of defendants, not just competitors. Two examples of consumer surveys in non-competitive trademark cases: dilution surveys; and establishing secondary meaning in non-competitive cases such as, say, parodies. I don’t know that this structural difference translates into a lot of meaningful differences in the surveys, but it changes the cases’ complexion and may affect how the litigants approach the surveys. A second possible structural difference. Consumer surveys are effectively mandatory in implied falsity cases. In contrast, although surveys are important for establishing secondary meaning, many successful trademark cases never include a consumer survey. Range of Inquiry. In both false advertising and trademark surveys, consumers are surveyed about what meaning they derive from the specified stimuli. However, false advertising has a broader range of possible meanings that a consumer could ascribe. In trademarks, consumers are often asked if they recognize a mark or if the mark is similar to or associated with another mark. These questions are basically binary yes/no questions. False advertising doctrine is interested in what message(s) consumers received. A single claim could have a multiplicity of meanings to consumers–consumers bring heterogeneous perspectives to the claim, and words and images have numerous possible meanings. The result is that false advertising survey questions tend to be more open-ended and require multiple iterative questions (progressively becoming more close-ended) to ferret out the consumer’s interpretation of the claim. Furthermore, a single product may appeal to multiple consumer segments, so more expensive tests may be required to distinguish each segment and determine what message(s) they received. Testing Environment. 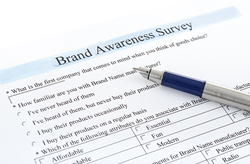 A false advertising survey typically seeks to determine what decision consumers will make in the marketplace in response to the claims at issue. Thus, every little fact about the testing environment matters. This is true with trademarks as well, but false advertising claims evaluation typically draws on a wider range of potentially relevant facts. In false advertising, there may be multiple versions of ad copy or claims that need to be tested together. The tester wants to replicate the buying environment as closely as possible, though a testing environment typically is stylized. The tester also wants to present controls that differ only with respect to the claims at issue. This can be a challenge; it may be difficult to manufacture an appropriately controlled ad copy or control specimen.